The Life Of Houdini Movie Planned by Academy Award Writer and Famed Producer Dore Schary With the Help of Houdini's Brother Hardeen in 1944.
technical adviser for a movie to be written by famous Academy Award winning writer Dore Schary. "The Film Daily 1944" "1944 Vanguard has extended producer Dore Schary's contract for five years. "Houdini" will be his next production"
"The Film Daily (Oct-Dec 1944)" "Hardeen, brother of the late Harry Houdini, has been made technical adviser on Vanguard's production based on the life of Houdini, which may go before the cameras in January Meanwhile, Noel Wesley who negotiated the deal has formed a prestidigitating unit, featuring Hardeen, to tour presentation houses. . . "
On a side note, in 1936 Hardeenin an early "talkie" "The Film Daily (Volume 69) Jan-Apr 1936"
"Hardeen in Vitaphone Film Theodore Hardeen, famous magi- cian and brother of the late Harry Houdini, heads the roster of players in "Medium Well Done," a one-reel novelty film, which enters produc- tion at the Brooklyn Vitaphone stu- dio today. Others in the cast of this short are Gertrude Mudge, Margaret Breen and Paul E. Burns, all of the Broadway stage. Lloyd French is directing. " In it, Hardeen played a "hardboiled detective" on the case of a bogus medium. The film was directed by Lloyd French, who directed many of the early Laurel and Hardy shorts. On another side note; "THRILLS OF YESTERDAY" SERIOUS MOMENTS FROM SERIAL DAYS (1931) This short film provides clips from silent films with amusing narration. 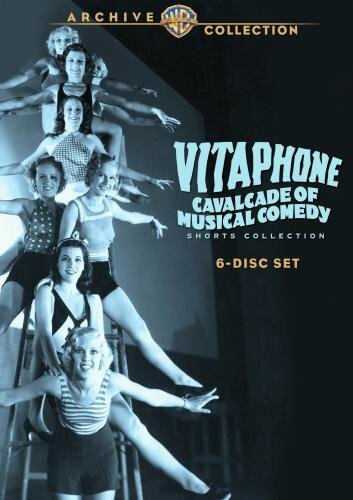 vitaphone Release 1261. BW-10 mins. "The Film Daily 1944" "Dore Schary comes East shortly to gather material for Vanguard's Houdini biographical film His first call should be on Joe Lee, Fabian's ad chief in Brooklyn, whose Houdini file is mountainous. . "
"The Film Daily 1944" "Frank O'Connor and Dore Schary, who wrote the original, "The Great Houdini," are now writing the screenplay. It will be made by Paramount, with Arthur Hornblow, Jr., Producing." This was announced several times in Film Daily in 1944 after Schary moved from Head of MGM B Unit where he did Bataan (1943) and Lassie Come Home (1943), etc. He then did Broadway Melody of 1940 (1940) - original story, Young Tom Edison (1940) - screenwriter, Edison, the Man (1940) - screenwriter MGM's Mayer was impressed by his versatility and ability to deliver hits such as Lassie Come Home (1943) and Journey for Margaret (1942) which introduced the biggest box-office draw the studio ever had in a child: Margaret O'Brien. 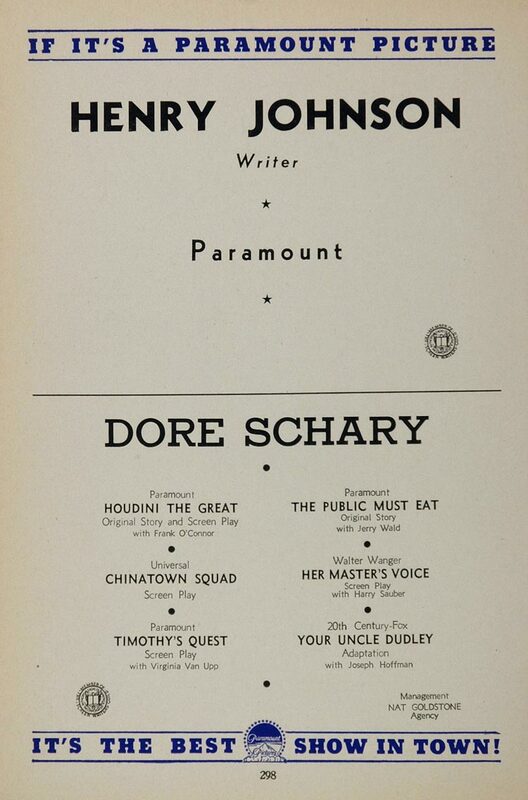 At the end of 1943 Schary accepted an offer with David O. Selznick's new independent division, Vanguard where he hired Hardeen, and doing I'll Be Seeing You (1944), The Spiral Staircase (1945), etc. Hardeen died in 1945 and we find no further reference to Houdini after that. For Selznick he then did Till the End of Time (1946), The Farmer's Daughter (1947). The Bachelor and the Bobby-Soxer (1947), etc. Then as Head of RKO he did Mr Blandings Builds His Dream House (1948), The Window (1949), etc. Isadore "Dore" Schary (August 31, 1905 - July 7, 1980) an American motion picture director, writer, and producer, and playwright who became head of production at Metro-Goldwyn-Mayer and eventually president of the studio. In 1938 won the Academy Award for Best Writing, Original Story as co-writer of the screenplay for Boys Town. From 1942 to 1943, he ran MGM's "B" pictures organization. He moved to RKO where he enjoyed a brief period of total autonomy prior to it's purchase and ultimate ruination by eccentric millionaire Howard Hughes. He was with RKO Pictures when in 1948 he became chief of production at Metro-Goldwyn-Mayer studios. After WW II MGM's success as a studio declined. After lackluster financial performance in 1949-1950, MGM's parent company--sided with Schary, replacing Mayer as production czar in mid-1951. The MGM corporate office in New York decided that Schary might be able to turn the tide. In 1951 MGM installed Schary as president. 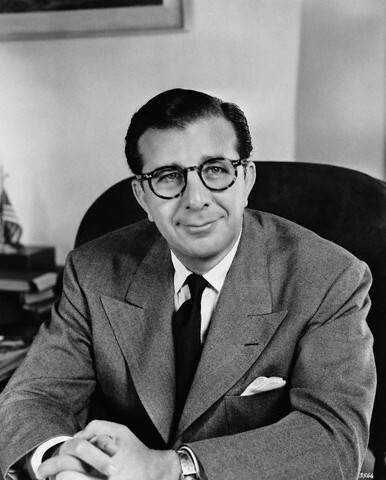 Became head of Metro-Goldwyn-Mayer (M-G-M) after ousting longtime head and founder Louis B. Mayer. He held the post from 1951 to 1956. The 46-year old Schary found himself in charge of MGM. During his term, the studio system was coming to an end due to United States v. Paramount Pictures, Inc. (1948), a Supreme Court decision that severed the connection between film studios and the theaters that showed their films. In addition, television was causing a decrease in theater attendance. In 1956 in his final year running MGM, he appeared on the show This is Your Life. Host Ralph Edwards stated that there has never been a show where more stars appeared to honor a guest. Following his departure from MGM, he wrote and procuced the Broadway play, Sunrise at Campobello (1958). The play won five Tony Awards. He wrote and produced the motion picture of the same name in 1960. He became an outspoken opponent of the the infamous McCarthy anti-communist investigations the House Un-American Activities Committee. He was a staunch Democrat and a liberal activist who believed that film could be used to educate and uplift. His liberalism and inclination toward so-called "message" pictures put him in conflict with his boss, Metro-Goldwyn-Mayer founder and studio head Louis B. Mayer, who was a diehard Republican and a major financial supporter of the party. He served as National Chairman of the B'nai B'rith's Anti-Defamation League. He returned to Broadway where he began. He'd wind down his career as a successful Broadway producer, director and playwright focusing much of his attention on the life of his personal hero, Franklin Delano Roosevelt. The Unsinkable Molly Brown (1960) - producer, director The Devil's Advocate (1961) - writer, producer, director Herzl (1976) - writer, producer and others. He died in 1980. "The Film Daily (Volume 69) Jan-Apr 1936" Hardeen in Vitaphone Film Theodore Hardeen, famous magician and brother of the late Harry Houdini, heads the roster of players in "Medium Well Done," a one-reel novelty film, which enters produc- tion at the Brooklyn Vitaphone stu- dio today. Others in the cast of this short are Gertrude Mudge, Margaret Breen and Paul E. Burns, all of the Broadway stage. Lloyd French is directing. 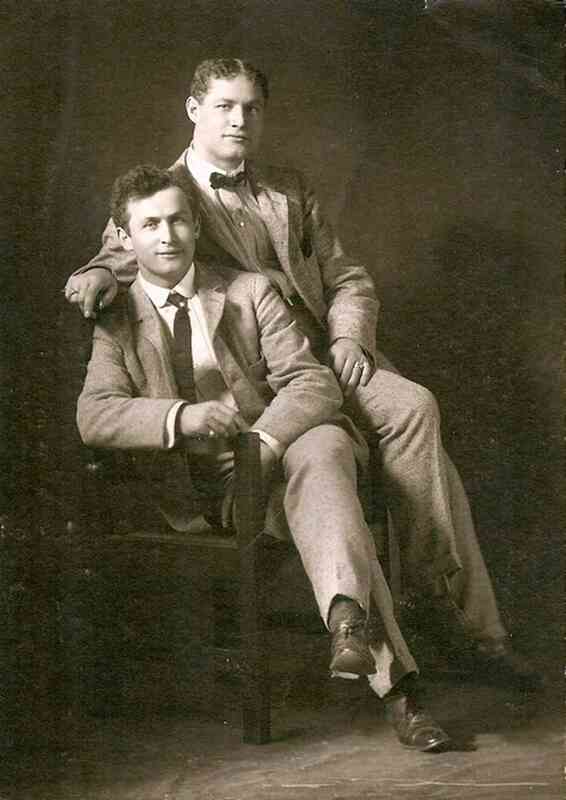 http://www.newspapers.com/image/59874914/ Article 1936 Joe Lee tells off being publicity man for Tom Mix and Houdini.Weshington during the senate hearings along with a Houdini booking.